infaquerical: a term created by my friends Candy and Castro,* who did not identify with either monogamy or polyamory, and wanted a new framework for thinking and living their coupledom. After writing out the aspects of their relationship that matter to them, together they birthed this word. Since its inception, they’ve been using infaquerical as a touchstone as they navigate complexities of a nontraditional, gender-bending and anti-capitalist romance. Castro might say to Candy: querida, I really want to spend my time with you: it’s been a hard week and my instinct is to retreat with you into our little world. But since we’re in an infaquerical relationship I think it’s important for me to spend some time with my homies, rather than defaulting into monogamous isolation. Or Candy (feminine-centered) might relish opening doors for Castro. Or Castro (masculine-centered) might enjoy sitting on Candy’s lap in public. As you might imagine, I instantly fell in love with this dope-as-hell word. Not only for the meanings it carries, but for the process of intention that shaped it, and the ways it might live through people’s loving thoughts and actions. 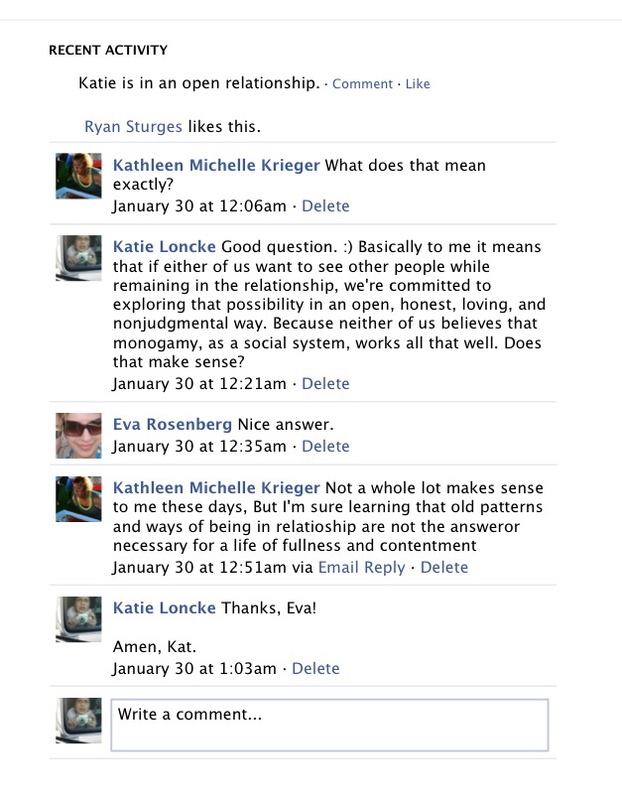 Reminds me a bit of the way Ryan and I attempted to (re)define our “Open Relationship” Facebook status in the early days. Now, over two years later, Ryan and I have decided to end our time as a couple. And I think the way we’re doing it reflects the infaquerical qualities of our time together. Non-blaming. It so happens that our breakup is nobody’s fault. If a couple (or group) decides to split up because one person wants to have children and the other(s) don’t, is anyone to blame? Ryan’s and my situation differs in specifics, but the gist is similar: our needs and desires just don’t happen to match up. Since we’ve spent over two years together responding to our conflicts with compassionate listening rather than defensive blaming, the breakup conversation, too, remained drama-free. Community building. Typically when we think of a community supporting a couple, we might imagine a wedding (if we’re more mainstream) or a, Octavia-Butler-esque collective of people (and/or vampires), romantically and non-romantically involved, sharing resources and helping to raise the next generations. But it seems to me that for infaquerical relationships, the breakup is also an important moment to deepen community ties and trust. Especially when, as is the case with Ryan and me, the former partners share friends/comrades and important projects. Like Candy and Castro, Ryan and I have always felt it’s important to encourage each other to deepen friendships even while remaining anchored in a primary partnership. Now I see the fruits of this orientation. The day Ryan and I decided to separate, I later ran into one of his friends on the street, and as we were chatting it came quite naturally to me to ask this friend to check in on Ryan, to let him know that he’s loved and cared for. I know Ryan would do the same for me. Enlightening. One of the most precious aspects of our relationship — and one that I’ll carry with me — was the way Ryan and I supported each other’s Buddhist practice. And as Thanissaro Bhikkhu says, “This is what we’ve been practicing for: the situations where the practice doesn’t come easily,” a.k.a. crises, or “storms.” A breakup like ours encourages us to cultivate paramis (positive qualities) of patience, generosity, acceptance, compassion, and determination. And while it may not hold true for everyone, I’ve noticed that for me, times of disorientation and big emotion (Pema Chödron famously calls this “groundlessness“) can actually flow spontaneously into deeper dhamma practice. When the mind and heart get overloaded, it can be easier to escape the tyranny of cognitive thought. Notice more sensations; notice the quality of change itself. Naturally, separating from someone we love brings pain. Not tryna deny that sadness. Splitting up with Ryan means losing my best friend. But if I’ve learned anything from dharma and visionary politics, it’s that within crises — inside the instabilities: of gender, of capitalism, of heteropatriarchy, of the mind — we can also find opportunities for liberation. With deepest gratitude to everyone who has loved and supported me and Ryan, as a couple and as independent people: you bring infaquerical to life! [M]y my housemate Ray, Candy and I all thought we should re-name and re-define our reality by creating an evolving framework and term that speaks to our lived experiences. So, infaquerical was a trio effort which is why it is also so wonderful because as Candy pointed out, the way we defined our reality included another person (Ray) not just the two of us. Infaquerical: a magical, radical, revolutionary and romantic relationship between two non-gendered conforming people; they live to restore humanity instead of living to make profit; have the desire to decolonize their mind and to abolish male supremacy; value familia (biological, chosen and communidad) and challenging male supremacist ways of thinking. Katie, I wish for you equanimity and also for Ryan. Even separating need not mean losing your best friend for good. My son, who is 30, remained friends with his ex-wife after their divorce and herecently moved in with her and her guy. It is temporary to be sure, but it really makes me happy to see people maintain important relationships even if they change shape. Love to you both. Blessings to you and Ryan. I so appreciate the conscious way in which you’ve gone about your relationship together. I wish I had had the tools to think of breakups from my past in radical/revolutionary ways. It’s great and you and Ryan do! One of my closest friends now is somebody I had a breakup with 7 or 8 years ago, which I’m grateful for. Something to look forward to, maybe, for you and Ryan! It’s also wonderful when folks can understand deep incompatibilities and act on that understanding–much better than head-in-the-sand stuff that can be so easy to slip into.